The decisive state in the 2000 presidential election has received less and less attention over the last twelve years. Florida tilted more Republican than the nation in the 2004 and 2008 presidential elections, and Kerry’s pursuit of Ohio combined with the emergence of new battlegrounds in the Southwest and the Mid-Atlantic to break Florida’s stranglehold on the Electoral College. But while few argue that Florida is 2012’s most important state, its 29 electoral votes—the most of any battleground state—remain hotly contested. Indeed, the campaigns have spent more on advertising in Florida than any other state, although big spending is as much a product of the state’s size as its competitiveness. Early on, most advertisements were purchased by the Obama campaign, presumably in an attempt to overcome the state’s slight Republican lean. But recently, Romney has begun to pour more money into the state. According to new data from NBC’s First Read, the Tampa and Orlando media markets have surged up the rankings and now stand as the second and third most heavily saturated markets in the country. Perhaps more significantly, the two Florida markets are the only two of the ten most saturated media markets where Romney is outspending Obama, suggesting that the Romney campaign feels compelled to play catch-up in a state expected to tilt toward the Republican candidate. If the Romney campaign’s internal numbers are similar to the public polls, then their decision to invest more heavily in Florida is unsurprising. After a wave of favorable polls following Romney’s triumph in the GOP primary, Obama appears to hold a modest lead in most surveys over the last 45 days. Representatively, two Quinnipiac polls conducted in June show Obama leading by 4 percentage points after the same firm showed Romney leading by an average of 3 or 4 percentage points in May. Much of the change appears to be driven by a collapse in Romney’s favorability ratings among white working class voters—precisely the effect predicted by advocates of attacks on Romney’s time at Bain Capital. Romney’s favorability rating among white voters without a college degree dropped by a net-15 points between the May and June Quinnipiac polls and Romney’s standing in the horse race declined by a net-10 points. While Romney fell among college educated white voters, the losses were minor compared to declines among whites without a college degree. 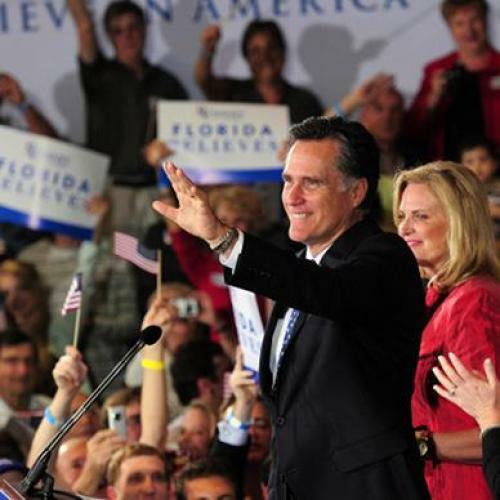 Romney’s renewed weakness might not translate into many votes for Obama, since white working class voters in Florida hold an even dimmer view of the President than Romney. However, dissatisfaction with two unappealing choices might just lead these voters to stay home, and the percentage of white voters without a college degree indicating that they do not intend to vote increased in every successive Quinnipiac poll, rising from 1 to 5 percent over the last two months—more than any other demographic group in Florida. Even if Obama can’t sway disaffected white working class voters, low turnout among voters with reservations about Obama’s performance is still a boon for the President’s reelection chances. Obama’s diverse base gives him a relatively high ceiling, and Romney will need to consolidate dissatisfied white working class voters to swamp a strong Obama showing in southeast Florida and Orlando. Obama has problems of his own. A majority of Floridians do not approve of the President’s performance or believe he deserves reelection. But Florida is a state that Romney ought to hold in the event of a close national election, and the possibility that Obama’s relentless attacks on Romney’s record have nudged the state toward the national mean would represent a meaningful tactical victory for the Obama campaign in the early stages of the race. While Obama possesses plenty of routes to victory without Florida, Romney would be hard pressed to overcome a loss in the Sunshine State.